Hydraulic fracturing or “fracking” is a technique the oil and gas industry uses to extract gas from underground shale formations not accessible by traditional extraction methods. Fracking is the process of injecting water, chemicals, and sand into an underground well with the use of high-pressure machinery, thereby creating fissures in the rocks through which oil or natural gas can be released. Fracking, however, is fraught with controversy. Although fracking can bring money and jobs to major shale regions while also reducing the price of natural gas on a national scale, fracking may have public health risks for local communities. Local health departments should be ready to provide input if their communities are propositioned by the oil and gas industry for fracking activity. 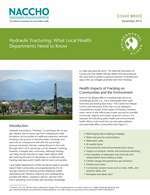 This issue brief presents a general overview of fracking and ways that local health departments can mitigate potential harm from fracking.